2. The awesome guy or gal who works at your local bike shop and fixes your bike with tender love and care (even when it is in sad condition). We will be focusing on definition number two. 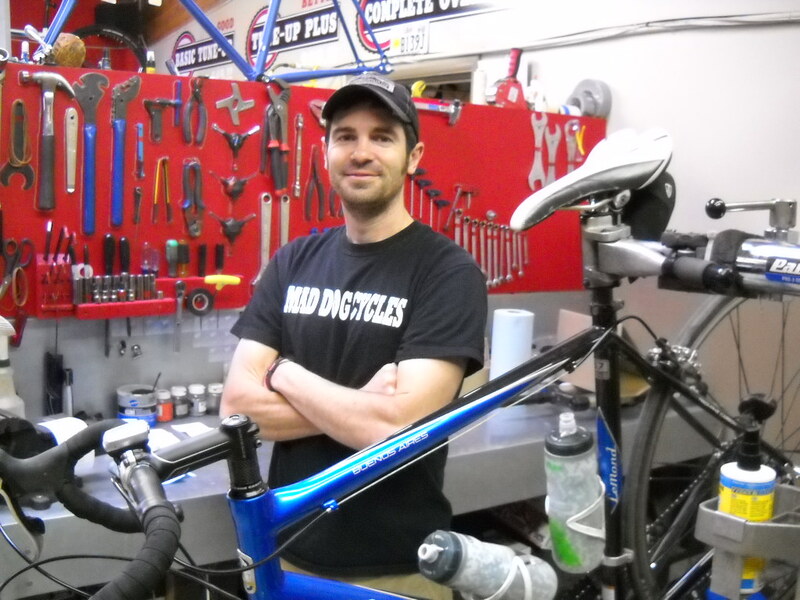 With Bike Month upon us and a whole slew of events on the way next week (click here) we figured it would be a good idea if we all got to know a little more about our local shops and local bike techs. Our third and final interview comes from Dave Dean of MadDog Cycles in Provo. BikeProvo: What is you favorite bicycle currently, and what type of riding do you do mostly? Dave: I have a Gary Fisher Superfly 100. I mostly do mountain bike racing. BP: Superfly 100? Wow, that’s full carbon right? BP: That must be nice to race on. Alright, next question. What do you like most about riding in Provo? D: I really like how close and convenient the mountain bike trails are. It is nice to be able to get a ride in before or after work. Also (laughing), there always seems to be a cute girls on bicycles. BP:(Laughing) Do you ever talk to these cute girls? D: No, they are usually going to fast (laughs). D: Sorry. But I would like to say that while I love riding in Provo I think the city could do better with the bicycle lanes and connectivity. For example why is there not a lane on University? BP: That is a great point. I will make sure to include that in the write up. But, we have to keep moving on. What is your favorite ride here in Provo? D: I really like South Fork up Provo Canyon. You can ride there 1,000 times and still be able to go and have fun. It has everything you want in mountain biking climbs, downhill, single-track, everything. Then, on top of all of that, you are in the woods so it is really fun and diverse. BP: I still have not done much mountain biking in South Fork but, you just convinced me. If you had one piece of advice for riders in Provo what would it be? BP: (Laughing) That sounds like great advice. Alright, now the hard question. What is your fondest memory from bicycling? D: That’s easy. It is any time I can be with my friends on the race team. I love racing and the race team not because I love to go fast, even though I do, I love these things because riding bikes with other people is great. It is the relationships that keep me coming back year after year. It is the personal connection with good people. When you ride with other people that are just as good or even better than you they push you and you really can feed off of that to become a faster and better rider. Does that answer the question? BP: Yes. Thanks Dave for you time. A big thanks to Dave for giving us some time and to MadDog Cycles. MadDog has been and is a big supporter of riding in all it’s types and forms. They are always offering courses and group rides for every skill level. Make sure to check them out and to keep an eye on BikeProvo during Bike Week to see what they are doing. MadDog’s tune prices are below. Basic Tune $50: Gets the brakes nice and tight, the shifting nice and smooth. They take the wheels off the bike and true them in a stand. This also includes a basic lube and clean. Tune-Plus $100: This will get you everything the Basic will but they will also take apart your entire drive train clean it re-lube it and put it all back together. Complete Overhaul $150: It is what is says. They strip the bike down to the frame deep clean everything then re-lube it and re-assemble. If you have an old bike that you want to be like new this is the route to go. This entry was posted in Bike-Friendly Business, University Bike Scene by Zac. Bookmark the permalink.